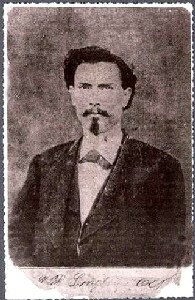 On this date in 1878, “gunfighter” Bill Longley was hanged for murder in Giddings, Texas. This flim-flam man was an anti-hero of the Wild West, a near-exact caricature of everything disreputable about his milieu. Remorselessly homicidal, virulently racist, and pathologically unfaithful to any bond of honor or friendship: “an idle boaster, a notorious liar and a man of low instinct and habits,” in the estimation of an officer of the army cavalry regiment from which Longley deserted. And he was a relentless self-promoter pleased to exaggerate both the quantity and the valor of his sixguns’ conquests. Longley’s end at the end of a rope — for murdering his childhood friend in solidarity with some uncle’s ill-founded grudge — makes a fittingly puerile end to a repulsive career, and not least because Longley’s family later circulated rumors* that Longley had connived with his executioners to escape the noose and been spirited away under a false name. Recent DNA testing proved that story false, but most of the Longley mythos is regrettably forensic-proof. The outlaw himself was his own Homer, perhaps consciously playing catch-up with the legendary bandits already afoot in the land. ** It’s certainly the case that he was a wanted killer, and a renowned marksman. Upon these gifts, Longley spun preposterous tales of his exploits in 1860s-70s Texas: being shot out of a noose at an attempted lynching;† slaughtering men and women (particularly blacks: his favored prey) in bunches; riding with the Cullen Baker gang; killing people in fair fights and not for their money. “His hot temper, his fondness for liquor, and unsettled conditions during reconstruction led him to become one of the most daring gunslingers of his day,” is how a Texas state grave marker reckons him, with a warmth the Lone Star State does not reserve for its present-day “daring gunslingers.” No doubt “unsettled conditions” have been involved in many of those crime sprees as well. Longley’s last arrest in 1877 removed him from these pursuits long enough to burden the local Giddings Tribune (and anybody else who would listen) with a steady supply of letters trumpeting his ferocity … and as his fate became apparent, his eventual treacly and apparently sincere contrition. “My first step was disobedience; next whisky drinking; next, carrying pistols; next, gambling, and then murder, and I suppose the next step will be the gallows.” The classic fall and redemption story. After an escape attempt and a foiled scheme to bribe the guards, Longley gamely took his redemption in a botched hanging that dropped him so far that his feet reached the ground. The executioners had to muscle the rope back up into the air and keep it there for 11 minutes to get him where he could choke to death. There’s an excellent HistoryNet article describing “Bloody Bill” Longley’s times and crimes in great detail here. There’s a wee genealogy, including the interesting tidbit that Longley’s father helped bury the dead of Goliad, here. * Apparent cause of the rumor: the mom couldn’t deal with Longley’s wicked character and dishonorable death, so the family deceived her, even forging letters from “Bill Longley”. ** Most particularly, John Wesley Hardin. Longley eagerly claimed responsibility for killings that might not even have happened, in an apparent attempt to top Hardin’s body count (27 or 28) with his own (allegedly, 32). Just prior to his execution, influenced by redemption or hope for clemency or whatever, Longley downgraded his career notch count to “only” eight. † This most famous and fantastic of all Longley’s “exploits” seems to be sourced to nobody but Longley himself; notwithstanding that prima facie credibility deficit, it’s still retailed as fact on a number of online Longley bios. ‡ This last episode was among the crimes of Longley’s last three years’ liberty that might have been prevented had not the Lone Star State refused in 1874 to honor a reward posted on the outlaw by that carpetbaggers’ Reconstruction regime. Un-paid, Longley’s captors simply turned him loose instead. That’s federalism at its finest.